Home » Shirts by Type/Size » Children's Shirts » Air Jamaica Kid's Shirt! AThe perfect Kid's shirt. The Air Jamaica "Island Hopper" T-Shirt. Air Jamaica?s brightly colored Aircraft on a 100% cotton white shirt. Available in Kid's sizes 10-12 and 14-16. 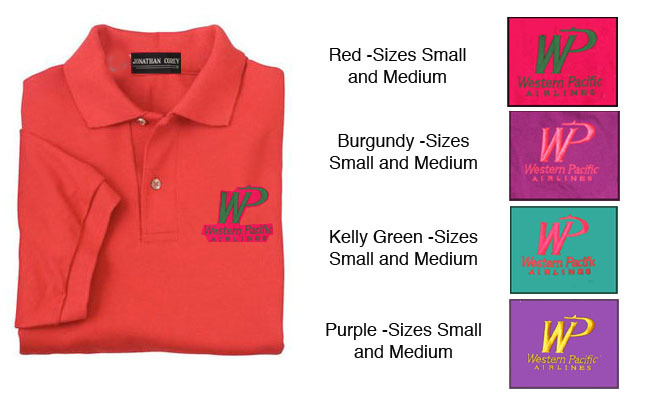 Western Pacific Polo, Size Small, Medium, and Large!